Home > Local News > Vermonters shoulder 11th highest state-local tax burden in U.S.
Vermonters shoulder 11th highest state-local tax burden in U.S. 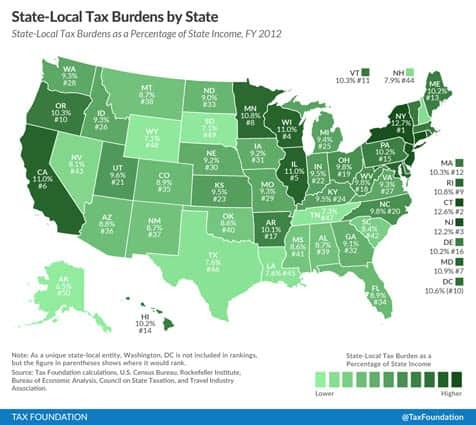 Shades of green represent annual State-Local Tax Burden as a percentage of State income for FY 2012, with lighter shades representing lower, and darker shades representing higher percentages. In Vermont 10.3 percent of total resident income went toward state and local taxes in FY 2012, according to the annual State-Local Tax Burden Rankings released Jan. 20, 2016, by the nonpartisan Tax Foundation. The U.S. average was 9.9 percent. The report highlights the state-local tax burden on taxpayers in each of the 50 states, details how much residents pay to their state and other states, and illustrates tax burden trends over time and within each state. State-local tax burdens are very close to one another and slight changes in taxes or income can translate to seemingly dramatic shifts in rank. For example, Maine (13th) at 10.2 percent and Colorado (35th) at 8.9 percent only differ in burden by just 1.3 percentage points. However, while burdens are clustered in the center of the distribution, states at the top and bottom can have substantially different burden percentages—e.g. New York (12.6 percent) and Alaska (6.5 percent). Significant amount of taxation occurs across state lines and this shifting is not uniform, it is important to note. For instance, one might pay sales taxes at the local corner store, but also pay sales taxes when on vacation in another state. This shifting should not be ignored when attempting to understand the burden faced by taxpayers within a state. State Tax BurdenState Tax RatesState-Local Tax BurdenTax FoundationVermonters shoulder 11th highest state-local tax burden in U.S.